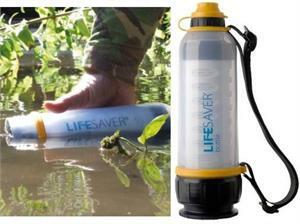 First of its kind ultra filtration water bottle. This bottle provides you with only clean pathogen free water as it filters all microbiological contaminates like H1N1with no need for chemicals or additives. We are extremely excited about offering these as they provide an answer to global pollution as well. In Lifesaver's testing this bottle removed all bacteria and viruses in excess of legal requirements and fully complies with US British and European Drinking water Regulations. No matter where you are geographically, this will hydrate you and keep you safe from water contaminates!